Marijuana stocks are breaking out – See what to watch to get it right! The entire stock market has experienced a massive correction this winter. 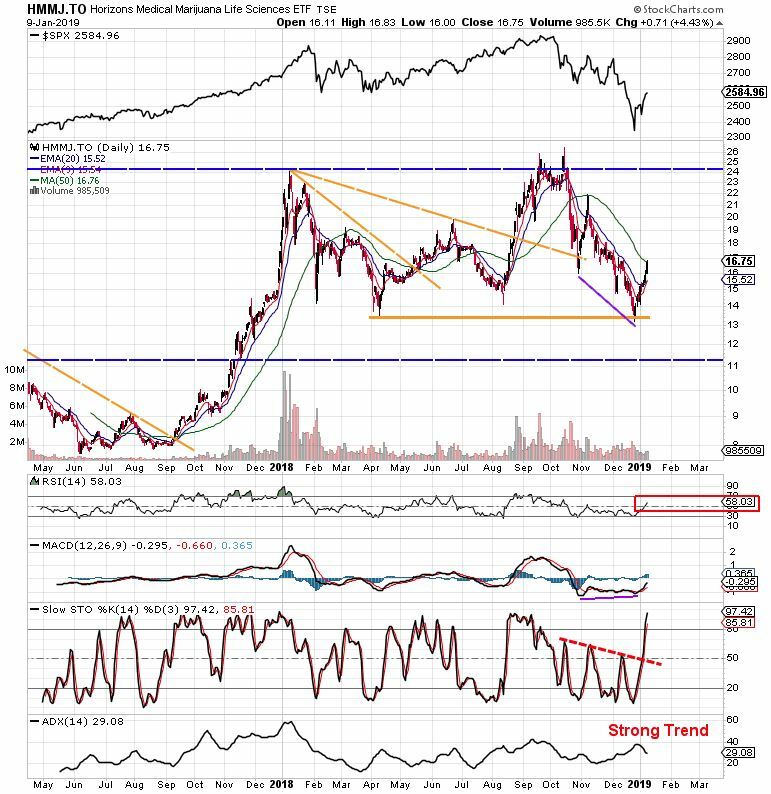 The marijuana stocks as well as the other stocks across various industries have taken perhaps a downhill direction bringing a lot of confusion into a financial system. The inflation and trade war threats have forced investors to re-balance their portfolios in favor of stronger and valuable companies between all stock market sectors. One of the promising and ambitious sectors that draws a very positive picture in the future is legal Marijuana Business. Thus, cannabis investing becomes more and more conscious for broad array of investors around the financial market. Legalization of recreational marijuana in Canada, several states in the USA and medical marijuana in constantly increasing number of countries around the world drags investors into a conclusion that cannabis industry may be there where automobile industry was in 1910! The year 2018 was wild for marijuana stocks, it was as volatile as such a speculative sector could be. HMMJ is the first and the most transparent ETF that serves as the best benchmark of cannabis sector at the moment. As you can see below, the pot stocks were reaching for new highs in September and October, however, the broad market correction stopped it, bringing a price lower to test its long-term support level (wide orange horizontal line). We have developed a technical model using three types of moving averages that have worked with trend determination pretty well so far. When the ETF is in a bull market, the price is sliding 9-period EMA. A 20 period EMA serves as a stronger support level and when this is broken down, the ETF happens to be in a bear market. When the ETF is in the bear market, the 9-period EMA serves as a resistance level and if there is an attempt to break it up, the 9-period EMA must cross 20-period EMA to bring the ETF into the bull market. This is the case now! The 50-period SMA was introduced now as I can see that it must be also pierced up if we want to make sure that current BREAKOUT is not a FAKEOUT. The price has closed just below this level. Thus, it may need some more adjustment retracing back toward 20 EMA before it goes up again. Note, this model has been working due to a very dynamic and volatile nature of the industry. Once the marijuana stocks stabilize, these moving averages stop working and others will become the functional support and resistance levels. RSI has entered above 50. 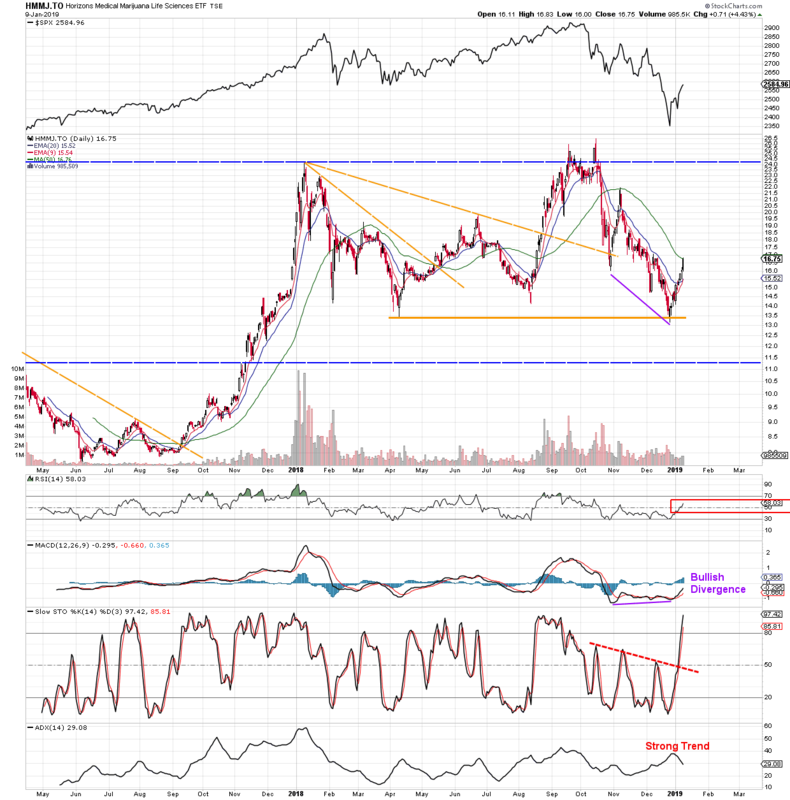 MACD is showing clear bullish divergence, which is a very positive signal. See the purple depiction on the chart. Slow stochastics have rocketed up breaking the downtrend. See the red dashed line. ADX is showing still a strong trend. It has been actually trending since the middle of July, since when it happens to be above 20. As most of the industries, also this one is positively correlated with major American indexes. Even though there are doubts about the economy at the moment due to slower growth, inflation, etc…, the long-term view in the stock market is positive. Since the marijuana sector is young and ambitious, taking advantage of such “pullbacks” as this correction is the best what rational investor can do. Hence, it is wise to rebalance your portfolio and acquire some of the good quality stocks now. In short-term, the S&P hit its 200 SMA yesterday. This its strong resistance level at the moment and therefore, the S&P as well as HMMJ may consolidate in upcoming days before going up again. Industrial hemp in no more part of Controlled Substances Act (CSA). It was released on December 20 2018 as part of Farm Bill and represents the most significant change in terms of cannabis consumption. All the cannabis that has no more than 0.3% THC is treated like any other crop. This means that medical marijuana (CBD), which has much bigger potential than recreational in my opinion, is now federally legal. The companies will have it much easier to build their business in the US, the investors will have it much easier to invest in the US and possibly the banks will finally have it much easier to finance such businesses in the United States of America. 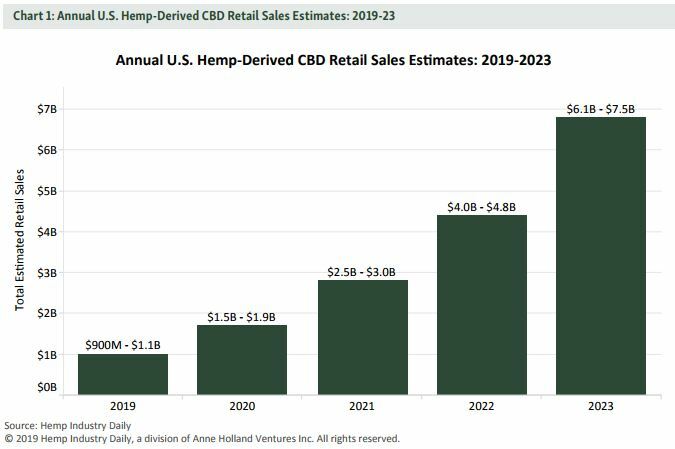 As you can see above, the forecast is projecting very fancy numbers within the next 5 years and therefore, it was never better to invest in good quality marijuana stocks as it is now.